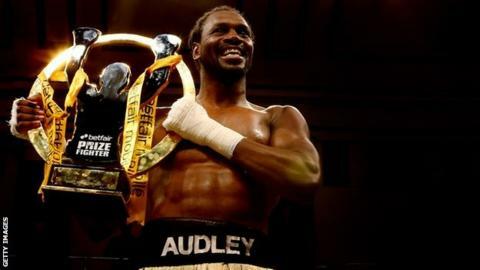 Audley Harrison has won his second heavyweight Prizefighter tournament, defeating three opponents on one night to take the prize at Bethnal Green. The Briton beat Dane Claus Bertino in 33 seconds, then Martin Rogan - who defeated Harrison in 2008 - on points. In the final, he knocked down American Derric Rossy twice, finishing the fight in the second round. The boxer, from Harlesden in north west London, won an Olympic gold medal at Sydney 2000, but he has lost six of his 37 professional fights, including his only world title shot - against Haye in 2010. After that defeat, in which he only threw one punch, there was talk that Harrison would retire, but he continued, beating Ali Adams 18 months later. In October 2012, Harrison was then knocked out in 82 seconds by Price, leading to more talk that he would retire. Instead, he vowed to continue, saying he wanted "one more shot at glory". After the victory over Rossy, Harrison said: "I've been trying to get back my mojo and you can see it's back. I'm in the best shape of my life and now I'm ready to finish my journey - finally."